Update April 6: It is not clear that the source for this story, Steven Huon, does in fact work for Apple, in spite of multiple claims on social media accounts. As such, while the information is reasonably credible (it’s just two million more than Apple executive Eddy Cue released two weeks ago) it cannot be confirmed. I’m checking with Apple PR on his status, and will update this post further when I hear from them. In a very quiet announcement on Twitter, Apple may have released some very significant news today. So quiet, in fact, that most people missed it. Apple Music just hit 40 million paid subscribers, according to one source. Screenshot of what Apple Music content director Steven Huon tweeted out April 4. 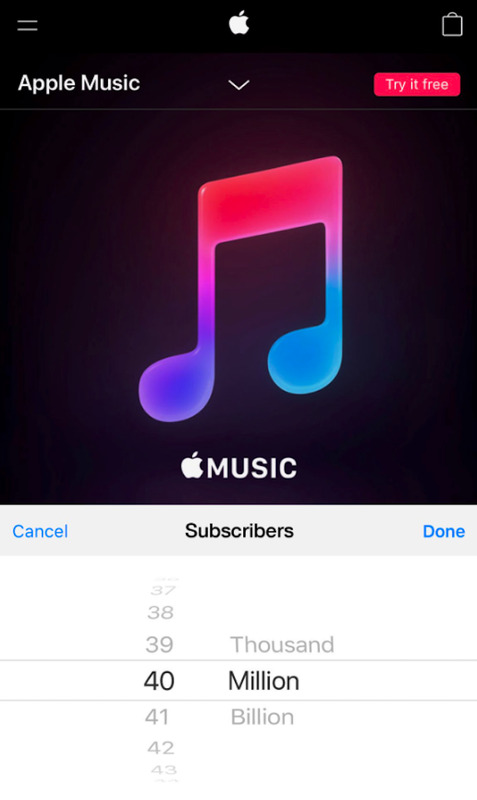 Someone who claims to be the music content director for Apple France, Steven Huon, tweeted out the image above which appears to indicate that Apple Music has hit the 40 million paying subscriber plateau. More importantly, it shows that Apple is aggressively fighting Spotify, which just went public and is now worth about $27 billion. In its pre-public-listing documentation, Spotify said that it had 71 million paying subscribers. One thing that might be helping: Apple’s HomePod is now released and has been on the market for two months. According to NPD, day-one pre-orders of HomePod were higher than any other smart speaker except the $50 Amazon Echo Dot. Either Apple has ramped up its sales efforts, or the company is getting better at converting trial users into paying subscribers.